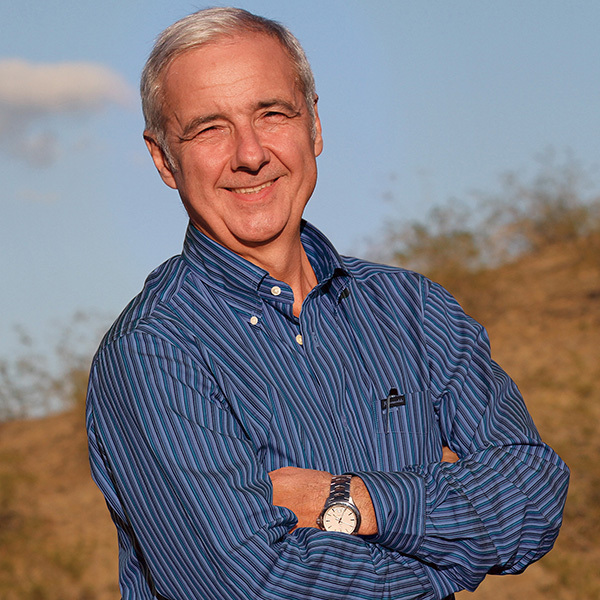 Osvaldo Sala joined Arizona State University as a Wrigley Professor in the School of Sustainability in August 2010. As president of the Scientific Committee on Problems of the Environment and a coordinating lead author of the Millennium Ecosystem Assessment, Sala is an international leader in ecological science and global environmental policy. Sala has explored several topics throughout his career including water controls on carbon and nitrogen dynamics in arid and semi-arid ecosystems, the consequences of changes in biodiversity on the functioning of ecosystems, and the development of biodiversity scenarios for the next 50 years. He is particularly interested in working with scenarios as a way of simplifying, understanding, and communicating the complex relationships that emerge from the study of social-ecological systems. While pursuing all these different questions, he used different tools from direct observations, manipulative field experiments, to simulation modeling. His work encompasses a broad range of scales from the global to specific regions. He has worked in the Patagonian steppe, annual grasslands of California, steppes of Colorado and deserts of Southern Africa and currently he has experiments in the Chihuahuan Desert in New Mexico. His work is reflected in more than 140 peer-reviewed publications and several co-authored books. Sala has served as editor of Global Change Biology, the president of the Argentinean Society of Ecology, and a member of the governing board of the Ecological Society of America. Osvaldo Sala is an elected member of the American Academy of Arts and Sciences, the Argentinean National Academy of Sciences, and the Argentinean National Academy of Physical and Natural Sciences. Sala, O. E., L. A. Meyerson and C. Parmesan eds. 2009. Biodiversity Change and Human Health: From Ecosystem Services to Spread of Disease. Island Press. ISBN: 978-1597264976. Peters, D. P., B. T. Bestelmeyer, K. M. Havstad, A. Rango, S. R. Archer, A. C. Comrie, H. R. Gimblett, L. Lopez-Hoffman, O. E. Sala, E. R. Vivoni, M. L. Brooks, J. Brown, H. C. Monger, J. H. Goldstein, G. S. Okin and C. E. Tweedie. 2013. Desertification of rangelands. Pp. 239-258 Climate Vulnrability: Understanding and Addressing Threads to Essential Resources. Vol 4. Elsevier Inc. Academic Press. ISBN: 9780123847034. Sala, O. E., L. Vivanco and P. Flombaum. 2013. Grassland ecosystems. Pp. 1-7 In: Levin, S. A. ed., Encyclopedia of Biodiversity, 2nd Edition. Elsevier. ISBN: 978-0-12-384720-1. Flombaum, P. and O. E. Sala. 2011. Efectos de la biodiversidad sobre el funcionamiento de los ecosistemas. Pp. 49-62 In: Simonetti, J. and R. Dirzo eds., Conservación Biológica. Perspectivas desde América Latina. Editorial Universitaria, Universidad de Chile. Santiago. Downs, M. and O. E. Sala. 2009. Grasslands. Pp. 614-618 In: Levin, S. A. ed., The Princeton Guide to Ecology. Princeton University Press. Princeton, NJ. Howarth, R. W., S. Bringezu, L. A. Martinelli, R. Santoro and O. E. Sala. 2009. Introduction: Biofuels and the environment in the 21st century. Pp. 15-36 In: Howarth, R. W. and S. Bringezu eds., Biofuels: Environmental Consequences and Interactions with Changing Land Use. Cornell University. Ithaca, NY. ISBN: 978-1441488299. Meyerson, F. A., L. A. Meyerson, C. Parmesan and O. E. Sala. 2009. Human health, biodiversity, and ecosytem services: The intertwined challenging future. Pp. 281-285 In: Sala, O. E., L. A. Meyerson and C. Parmesan eds., Biodiversity Change and Human Health: From Ecosystem Services to Spread of Disease. Island Press. ISBN: 978-1597264976. Meyerson, L. A., O. E. Sala, A. Froment, C. S. Friedman, K. Hund-Rinke, P. Martens, A. Mazumder, A. N. Purohit, M. B. Thomas and A. Wilby. 2009. Sustainable allocation of biodiversity to imrprove human health and well-being. Pp. 83-98 In: Sala, O. E., L. A. Meyerson and C. Parmesan eds., Biodiversity Change and Human Health: From Ecosystem Services to Spread of Disease. Island Press. ISBN: 978-1597264976. Ojima, D., C. Field, P. Leadley, O. E. Sala, D. Messem, J. E. Peterson, J. Born, L. Vanwey and M. Wright. 2009. Mitigation strategies: Biofuel development considerations to minimize impacts on the socio-environmental system. Pp. 293-308 In: Howarth, R. W. and S. Bringezu eds., Biofuels: Environmental Consequences and Internactions with Changing Land Use. Cornell University. Ithaca, NY. ISBN: 978-1441488299. Sala, O. E., L. A. Meyerson and C. Parmesan. 2009. Changes in biodiversity and their consequences for human health. Pp. 1-12 In: Sala, O. E., L. A. Meyerson and C. Parmesan eds., Biodiversity Change and Human Health: From Ecosystem Services to Spread of Disease. Island Press. ISBN: 978-1597264976. Sala, O. E., D. F. Sax and H. M. Leslie. 2009. Biodiversity consequences of increased biofuel production. Pp. 127-138 In: Howarth, R. W. and S. Bringezu eds., Biofuels: Environmental Consequences and Interactions with Changing Land Use. Cornell University. Ithaca, NY. ISBN: 978-1441488299. Lauenroth, W. K., D. G. Milchunas, O. E. Sala, I. C. Burke and D. C. Coleman. 2008. Net primary production in the shortgrass steppe. In: Lauenroth, W. K. and I. C. Burke eds., Ecology of the Shortgrass Steppe. Oxford University Press. ISBN: 9780195135824. Melillo, J. M. and O. E. Sala. 2008. Ecosystem services. Pp. 75-116 In: Chivian, E. and A. Bernstein eds., Sustaining Life: How Human Health Depends on Biodiversity. Oxford University Press. ISBN: 978-0195175097. Knapp, A. K., J. M. Briggs, D. L. Childers and O. E. Sala. 2007. Estimating aboveground net primary production in grassland- and herbaceous-dominated ecosystems. Pp. 27-48 In: Fahey, T. J. and A. K. Knapp eds., Principles and Standards for Measuring Primary Production (Long-Term Ecological Research Network). Oxford University Press. Shaver, G., T. Chapin, C. Duke, A. P. Kinzig, D. P. Peters and O. E. Sala. 2007. Ecological foundations of sustainability in a constantly changing world. San Jose McEnery Conference Center. Symposium organized at the August 6-10, 2007 Ecological Restoration in a Changing World at the 92nd Annual Meeting of the Ecological Society of America held with the Society for Ecological Restoration 18th International Conference, San Jose, CA.